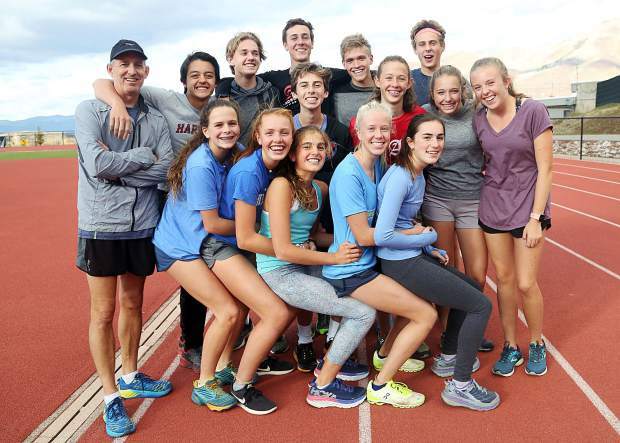 The Aspen High School cross country team is sending a full squad of boys and girls to the Class 3A state meet on Saturday in Colorado Springs. (Photo by Austin Colbert/The Aspen Times). What does that mean? Nobody really knows, including Aspen High School cross country coach Chris Keleher. The team chant may be a mystery to all but the runners, but their talent on the course is quickly becoming well known on the Western Slope. After finishing third as a team in both the boys and girls races at their regional meet Oct. 19 at the Aspen Golf Club, the Skiers are able to send a full squad to the Class 3A state meet Saturday at the Norris Penrose Event Center in Colorado Springs. The Aspen girls are headed back to the state meet for the second year in a row. The Skiers finished 12th last fall, with Kenny’s 29th-place finish leading the way. Clark was a few spots back in 37th. The majority of the Aspen girls, including Kenny and Clark, were only freshmen a year ago. Now sophomores, their expectations are a little higher. Also competing for the AHS girls at state will be Macy Hopkinson, Edie Sherlock, Bronwyn Chesner, Maggie Woodrow and Greta Hansen. The Aspen boys haven’t been to state as a team since 2013, when they finished 14th. The boys haven’t even had an individual qualifier since 2014, before this current group of seniors was in high school. Olson finished fifth at regionals and senior teammate Nicholas Galambos ninth to get the AHS boys back to the season finale. Both credited getting to host regionals at the Aspen Golf Club as a reason for their success. Also going to state for the AHS boys are Colt Whitley, Brenon Reed, Conner Chesner, Josh George and Riley Johnson. Basalt High School’s only qualifier is sophomore Sierra Bower, who won the girls race at the Aspen regional with a time of 20 minutes, 3.5 seconds. Bower raced in the state meet as a freshman, as well, finishing 35th. The 3A boys race is scheduled to start at 9 a.m. Saturday in Colorado Springs, while the 3A girls race is scheduled for 10:20 a.m.